The use of digital devices to attract birds is getting more and more attention. It’s been brewing on birding listservs for years. I wrote about it for WildBird Magazine a few years ago and recently David Sibley tackled it in his blog. However, it’s now getting the attention of mainstream media via this article in The Seattle Times. I can’t help but wonder if this article will inspire people who never thought of using taped calls to give it a go. The bottom line is that we do not have enough information or research to give a definitive answer as to whether to not it’s harmful to birds. When I wrote my article, I could only find one study on trogons done in the late 1970s to the early 1980s that showed taped calls did not affect nesting success of trogons. You can’t apply a trogon study to every bird out there. Sibley found a chickadee study that noted a high status chickadee could lose status by exposure to excessive playback, but low status chickadees could benefit from that. But heck, that doesn’t even have to happen with a smartphone and a speaker. I don’t know about you, but sometimes I unconsciously whistle back to chickadees while walking through woods or sitting in a yard…has my whistling knocked the status of a chickadee? Sorry, dudes. Until I see more studies, I think taped calls bother more birders than birds. But sometimes, using calls can help birds. 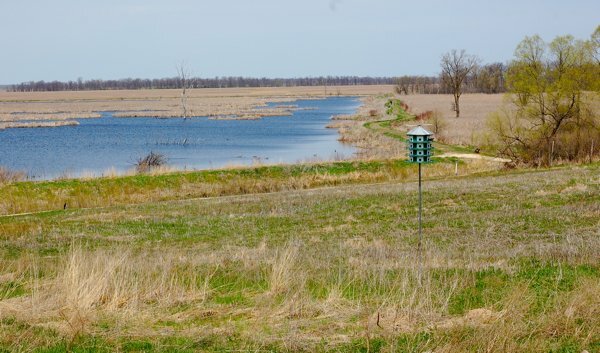 I know this going to be shock but Purple Martins are a great example (the above photo is an example of Purple Martin habitat taken at Horicon Marsh). These are colony nesting birds. They don’t nest alone like Tree Swallows, you usually need at least four nest compartments together to get their attention but 12 to 24 nest compartments is closer to the norm. Martins are notoriously tricky to attract. 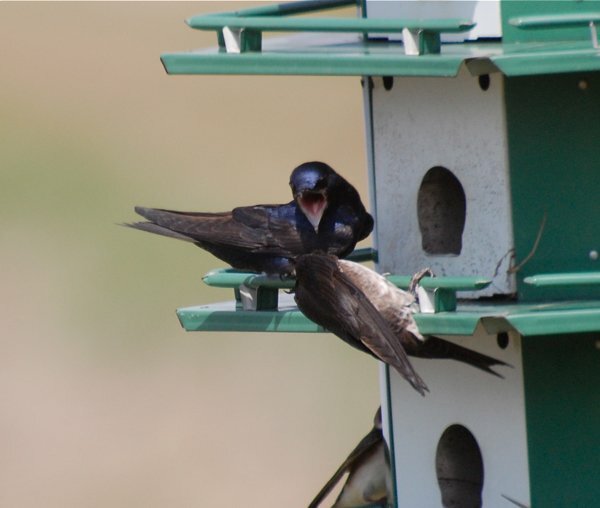 Once you get them, they can be very loyal tenants but I always dreaded someone with very little bird knowledge coming in to purchase a Purple Martin house. They are big, expensive and it can take up to five years to attract them even if you have the right habitat. If you do not have the right habitat or are unwilling to maintain it, it can become a very expensive House Sparrow nesting colony. One of the things you can use to attract them to a new house is playing Purple Martin Dawnsong. You can get it as a cassette, CD or even download an mp3 of it. You put your player of choice at the martin house at dawn and the thinking is that younger martins coming back from migration and kicked out of established nesting colonies by older more experienced males may hear the song and check out the new house and start their own colony. Martins have lost nesting habitat because these cavity nesters don’t have the old dead trees available and even if they do find martin houses, they can have competition from introduced species like House Sparrows and European Starlings. So, if someone puts up a martin house, is willing to help keep invasive species at bay and use a martin caller to bring in birds–they’re helping these native insect eating birds out. There are other tapes too. When I used to work at a wild bird store, we sold DinnerSong tapes which were Black-capped Chickadee calls or American Goldfinch calls used to attract in these birds to your feeding system. I’ve used the chickadee one to attract chickadees to a new feeder when I’ve moved to a new apartment and it worked like a charm. I don’t bother with other birds. 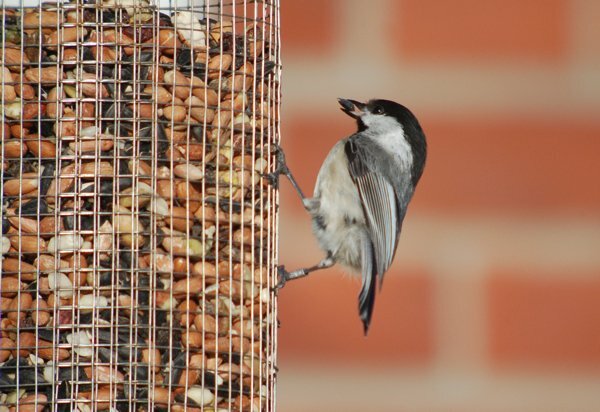 I figure once a chickadee finds a feeder, it’s a matter of time before other bird species follow them in. This can’t be applied to all birds but these are examples of playbacks of bird calls benefiting native bird species. I appreciate the alternative view on this topic and the anecdote about Purple Martins, but the article from the Seattle Times cited some studies, one done by a UW employee, and I think the anecdotal evidence they used should make birders think in more depth about why they are using the Apps and how much and how loudly. I’m not denying anything in that article. I used a link to that as an example of the mainstream media catching on to this birding controversy. The bottom line is that we have VERY little information on this subject and most of it is anecdotal which doesn’t work in my book. Also, the examples of martins and chickadees cannot be applied across the board to all species when it comes to using taped calls. But so many articles focus simply on attracting birds in for listing and photography. Sometimes it can be used to help. The use of playbacks to attract Purple Martins is like the use of mirrors and decoys to attract puffins to nest on islands without other puffins. Using them to call in territorial birds to get a look is another matter. It is a waste of a territorial bird’s energy in responding, and is a distraction to what is going on in the rest of a territory. It’s a bad idea. If a bird has to be manipulated into showing up for me to see it, I don’t need to see it. I had someone calling in a singing Brown Thrasher who was obviously on territory and the bird was going nuts. It did not seem ethical. I didn’t stick around to watch to see if the Thrasher showed up. The next week, in the same location, I saw one perched in the open and had great opportunities for viewing and photography without the bird being manipulated. Additionally, the Times article discusses several studies. Maybe more info could be given, but it’s there, and it’s not just about chickadees: “But a handful of studies suggest the practice is not entirely innocuous. Ordinary life already is tough for birds, especially during breeding season, said UW biologist Eliot Brenowitz, who studies brain wiring and bird song. In some species, males become accustomed to the voices of their neighbors, which makes them more likely to be alarmed by an unfamiliar, recorded call, he said. UW professor emeritus John Wingfield found testosterone levels increased up to tenfold in male song sparrows confronted with taped songs. They remained revved up for one to two days. “These males will continue to spontaneously sing and patrol their territory,” Wingfield said. “They get very aggressive and attack other birds.” And they were distracted from parental duties, such as feeding chicks. Elevated testosterone also may suppress birds’ immune systems, though that link is unproved, he said. This is more than enough information to suggest using apps/playbacks should be used in severe moderation. Making the argument that each bird species or family needs to be studied would just subject them to having to hear these playbacks and apps! What is the point of that? How many studies do we need? I would argue it’s common sense to avoid it in most instances unless it’s actually helping the bird in some way and THAT can be proven. Field trip leaders who feel pressure should not; any reasonable person can not blame a leader for a bird’s (in)appearance! I’m NOT disputing that it can get overused on field trips. I was on one at a festival and a leader tried to call in just about every bird–even a Tennessee warbler. If you have to call in a Tennessee warbler, you need to work on your birding skills. I think we need to compare bird calls to pishing or people who can whistle like screech owls–how does that compare to affecting birds via audio playback? I once pished up a song sparrow only to have it get nailed by a Cooper’s hawk–direct negative impact to the bird. Should everyone stop pishing? At the end of the day, birding in and of itself affects birds–whether you are using some sort of audio to call them in or not. Incidentally, in the trogon study, one of the nests that failed was staked out for a few days by a photographer. It wasn’t someone just passing through and taking shots, it was a lens aimed at the nest during all daylight hours for three days in a row. The birds were hesitant to go to the cavity with the lens watching them and no chicks fledged. The researcher couldn’t say for sure if a snake got the chicks or if there was disease, but that’s another area to research. I’m inclined to agree with Mary, I don’t see how the examples provided are applicable in the more commonly used scenario of using playback to attract territorial birds. Not that I think it should never be done, but any application should stress the use of moderation. Just a reminder that using playback to attract territorial birds is not permitted on US national wildlife refuges. It is still considered harrassment of wildlife. Until the regulations change, make sure you are not on US national wildlife refuge when you do it. Why would you assume that there is no effect on the birds? I would use the precautionary principle and assume bad effects in the absence of data. Clearly, the birds are hearing and responding to the taped call – that is the whole purpose behind birders playing taped calls. Given that birds are responding, I would assume that the taped birdcalls are having a negative effect until I have evidence to the contrary. To do otherwise is to assume an answer simply because of expediency. One, it is likely that birds can tell the difference between your imitation and the real thing. The evidence I’ve seen is that birds ability to distinguish bird song and bird calls far exceeds are own. This only makes sense – think of how good humans are at distinguishing other humans from each other by sight or sound, even after only seeing them once. But how many birds can you tell individuals apart easily by either sight or song? Second, the number of species that most people can even do a passable job of imitating is very low. Can you imitate a Black-throated Green Warbler (to pick a random example) such that even a human would be confused, to say nothing of a bird? Portable playback technology puts the ability to accurately imitate any bird in the hands of any person who wants it. The scale of imitation (and thus, potentially, disruption) is far beyond anything we could accomplish with just our own mouths and vocal cords. Of course, birding impacts birds, and we shouldn’t pretend that the mere fact of our being in the same area as the birds inevitably has impacts on them. The question is what to what degree do we want to impact the environment, particularly that part of the evironment we are there to see, and presumably want to preserve. Personally, I don’t think taped song or calls should be used on public land – particularly public land that birders frequent. In addition to the impacts on birds, don’t forget the impacts on other birders trying to bird by ear and wanting to hear actual birds, not your iPhone! That said, I do think that Mr. Sibley’s guidelines are an excellent compromise that do a good job of minimizing the impacts on birds and birders while still preserving the functional use for those that choose to use taped bird song. Actually, my black-capped chickadee is very good and has instigated territory calls of multiple males in one area. My eastern-screech owl isn’t bad either and can bring birds in. I’ve birded in Panama with a guide called the Human iPod because he can mimic just about every bird there and brings them in with his mouth (there’s actually a YouTube video of him). I’ve also met a guy at the World Series of Birding who does a darn fine winter wren. But far more people pish and that does have in impact. Granted, this is not the same as doing many birds on a smartphone but it’s causing an impact–do we know the full consequences of this impact? No and if we’re saying taped calls could be bad, then are we going to say absolutely no purposeful noise making to make a bird pop up in the field? It’s clear that this is a hot button issue. And this blog post was about the use of calls available for purchase to attract native birds to nesting and feeding areas. I find it interesting that people are zeroing on specific sentences which reaffirms my belief that this is an area in dire need of more research and study. We have some studies, we have no clear answers. We need facts before birders go off half cocked (on either side of the issue) and start brawling the field. If you don’t like taped calls–don’t do it and avoid bird festivals and birding guides that use it to bring birds in. If you want to do it, follow Sibley’s guidelines, that’s one of the reasons I linked to his blog post. If the science isn’t comprehensive enough (yet) to allow for a thorough assessment, put the birds first and use playback very sparingly – if at all. I have scarcely ever used it and am a happy birder nonetheless. I have never failed to see an “important” species (lifer etc.) because of my not using playback. Having said that, I do not regard the use of playback (or whistling, or pishing) as being always unethical or problematic. It depends on location, species and individual birds present. If a birder can assess all these factors and concludes that the use of playback is okay, then I guess it’s okay. “Imagine a scenario where ten birders fan out across a patch of forest, hoping to catch a glimpse of a bird that has been seen there recently. They move slowly and silently, sitting for long periods just watching. Their patience eventually pays off when the bird is seen moving through the undergrowth, and after gathering and sitting for another 45 minutes they all have satisfactory views and leave quietly. This could be viewed as a perfect example of patient and respectful low-impact bird study, or it could be viewed as a two-hour-long disruption of the bird’s routine, and if the bird was in the early stages of nesting and they sat close to the nest site for that long, the nest might be abandoned. The Sparrow Trap Door is an indoor bird trap with MP3 Call module. It uses male HOSP calls set to run at different times. The calls have made the trap a “sparrow magnet”. In a large atrium, mall or airport it is very successful.